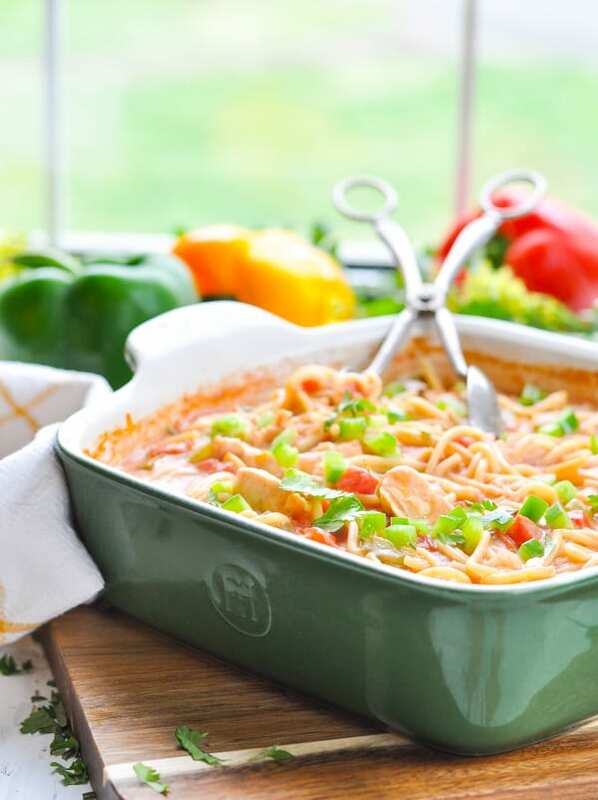 You don't even have to boil the pasta, cook the chicken, or sauté the vegetables for this easy Dump-and-Bake Chicken Spaghetti! Just stir all of your raw ingredients together and you'll have a family-friendly dinner that's ready for the oven in just 10 minutes. 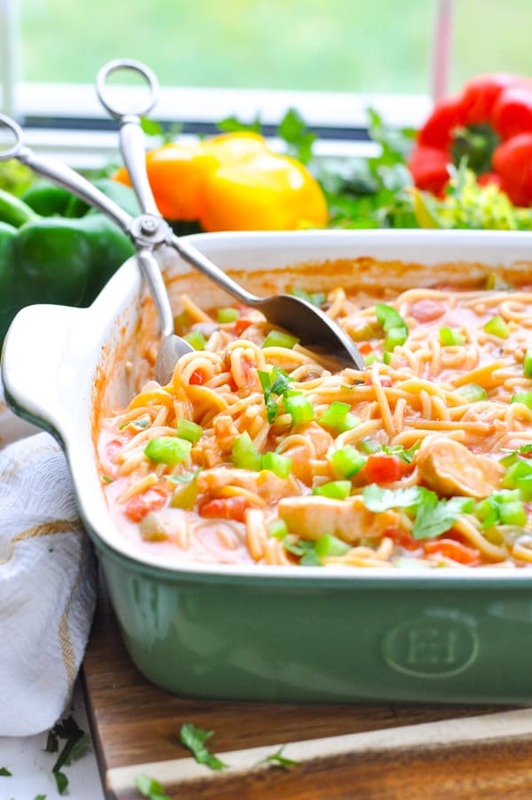 You don’t even have to boil the pasta, cook the chicken, or sauté the vegetables for this easy Dump-and-Bake Chicken Spaghetti! Just stir all of the raw ingredients together and you’ll have a family-friendly dinner that’s ready for the oven in just 10 minutes. I have yet to meet a child that doesn’t love a creamy pasta dinner. 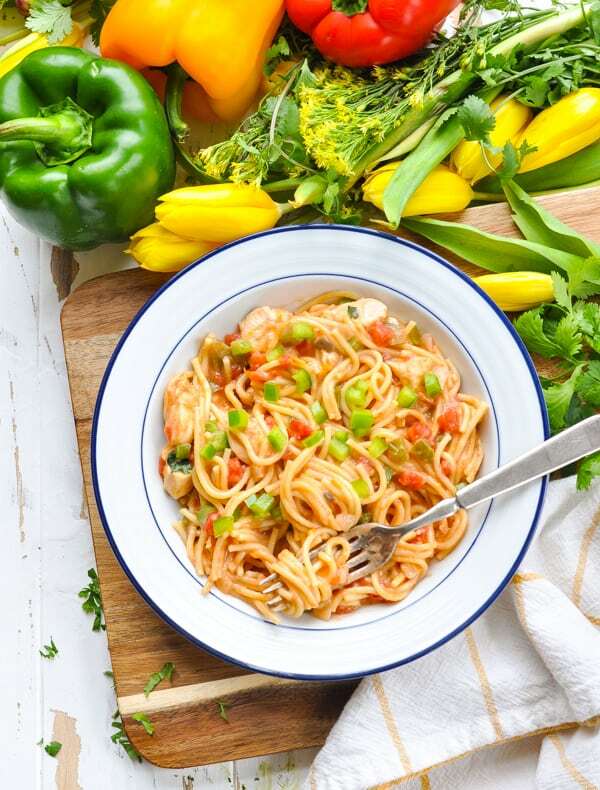 Add some chicken and fresh vegetables and you’ve got a complete meal in one dish (and you don’t even have to think about the sides)! 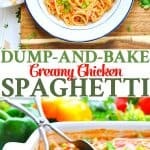 First of all, my dump-and-bake recipes obviously save you prep time in the kitchen. But what’s even better? 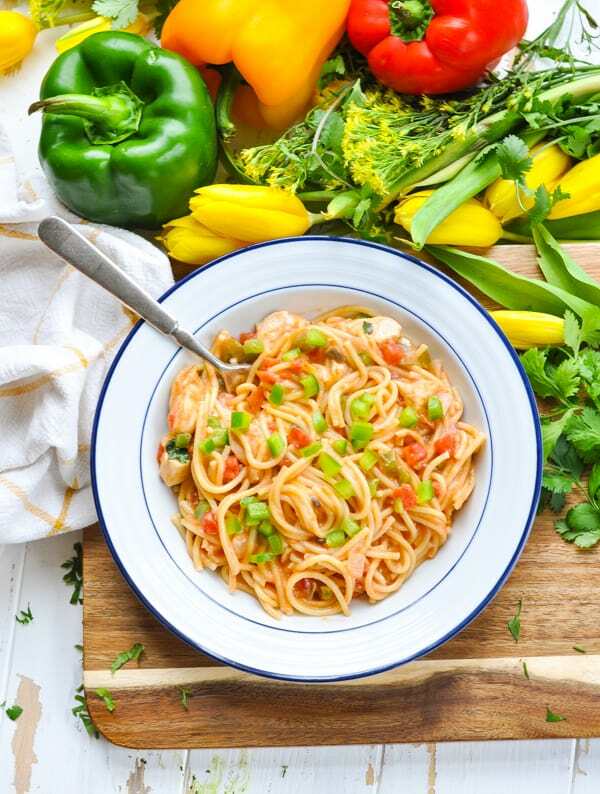 As the pasta cooks in the dish, it releases starches that thicken the sauce, so you get this rich, creamy Chicken Spaghetti without adding too much extra flour or butter. I’m a sucker for a can of Campbell’s Healthy Request Cream of Mushroom Soup in my casseroles, though! 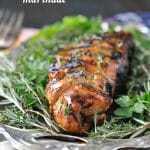 It adds easy flavor and texture that makes the dish feel like home. You will need to break the spaghetti into pieces before you add it to the casserole. Otherwise it won’t fit in the dish! Don’t be afraid to get in there and use your (clean) hands to mix, break the pasta, and make sure that most of your ingredients are submerged in the liquid. Don’t be alarmed if it seems like there is a lot of liquid in the dish! Your pasta will absorb much of the liquid as it cooks…right up until the very end. Even when the pasta is tender and you’re ready to remove the cover for the final few minutes of baking, you will still have quite a bit of liquid in the dish. That’s fine! It will thicken up while it’s uncovered, and it will continue to thicken after it comes out of the oven. Make sure that you don’t overcook the pasta, or it will become gummy and mushy. Don’t forget to stir the pasta halfway through the baking time, and a couple of more times as it’s finishing in the oven. Regular stirring allows the pasta and other ingredients to cook evenly, and ensures that the noodles don’t stick together. 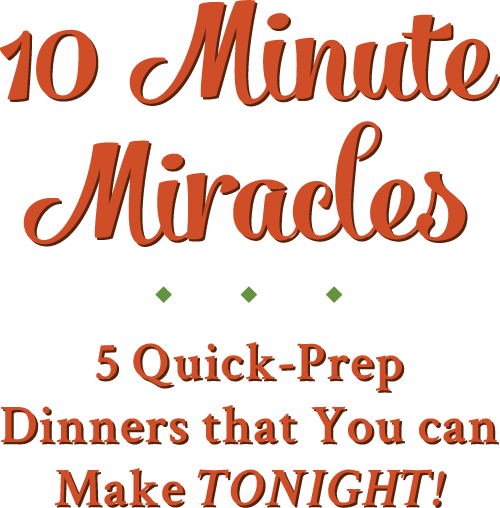 This is a mild, kid-friendly dish that all 3 of my boys gobbled right up! 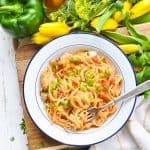 If you prefer a spicier or zestier Chicken Spaghetti, feel free to add a dash of crushed red pepper, more garlic, some hot sauce, or even just a bit of extra salt and pepper at the end. And one more tip! My children garnish their bowls of pasta with extra grated cheddar on top. Because you can never have too much cheeeeeeeese, right?! 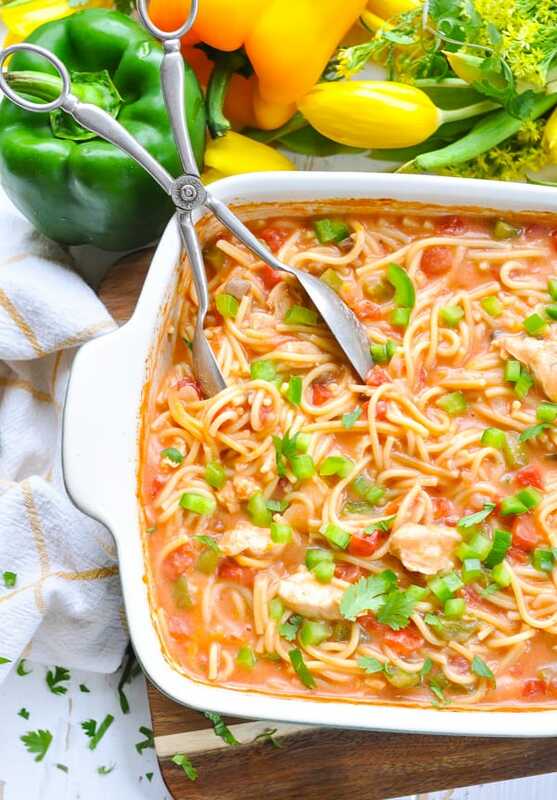 If you’ve tried this Chicken Spaghetti or any other recipe on The Seasoned Mom, then don’t forget to rate the recipe and leave me a comment below! 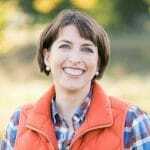 You can follow me on Facebook, on Instagram, on Pinterest, and on Twitter! Preheat oven to 425 degrees F. Spray an 8-inch or 9-inch square baking dish with cooking spray. In a large bowl, whisk together chicken broth and condensed soup until smooth. 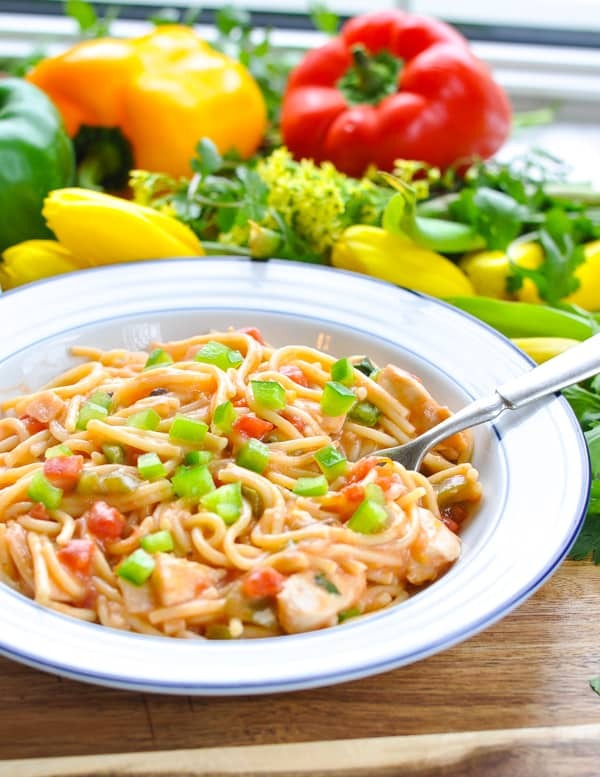 Add the uncooked spaghetti, uncooked chicken, tomatoes, onion, bell pepper, garlic, and ½ cup of the cheese. Stir (or use your hands) to combine everything together. Transfer mixture to the prepared baking dish, using your hands or a wooden spoon to gently press all of the ingredients into an even layer. You might need to break the pasta into smaller pieces in order to get as much of it as possible in the liquid. It doesn't have to be perfect, though! Cover tightly with aluminum foil and bake for 40 minutes, stirring halfway through the baking time. Uncover; stir again. At this point you should check the pasta to make sure that it is al dente (firm but just about finished cooking). If it’s still too hard, cover the dish and return to the oven until pasta is al dente. Then move on to the next step. Top with remaining ¼ cup of cheese. Bake, uncovered, for 5-10 more minutes, or until cheese is melted, chicken is cooked through, and pasta is tender. Give the pasta another stir, and then allow the dish to rest for a few minutes before serving. The sauce will continue to thicken a bit as it sits. Garnish with fresh parsley, if desired. Season with salt and pepper, to taste. 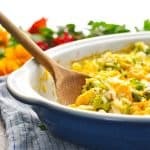 Cooking for a Larger Family? 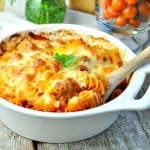 Double the ingredients and bake in a 9 x 13-inch casserole dish. You may need to add about 5 minutes to the cooking time, but otherwise the cooking instructions remain the same. Cooking Just for Two? 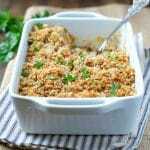 Cut the ingredients in half and prepare the recipe in a small, 1-quart dish. Cooking instructions remain the same. Just made this and it came out beautifully. I didn’t put any cheese in the casserole, and the sauce was still creamy and delicious. Stirred in a big handful of fresh spinach before topping (part of) the casserole with cheese for the last 5-10 mins. Happy family! Wonderful! Thank you so much, Anne! 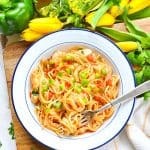 Grilled chicken spaghetti dish is easy and attractive. Very detailed recipe. Very delicious and nutritious food.